If your state requires both front and rear license plates, or even if it doesn't but you want to make a statement, you'll need this Front License Plate Bracket from Mopar to fit your 2011, 2012 or 2013 Grand Cherokee. 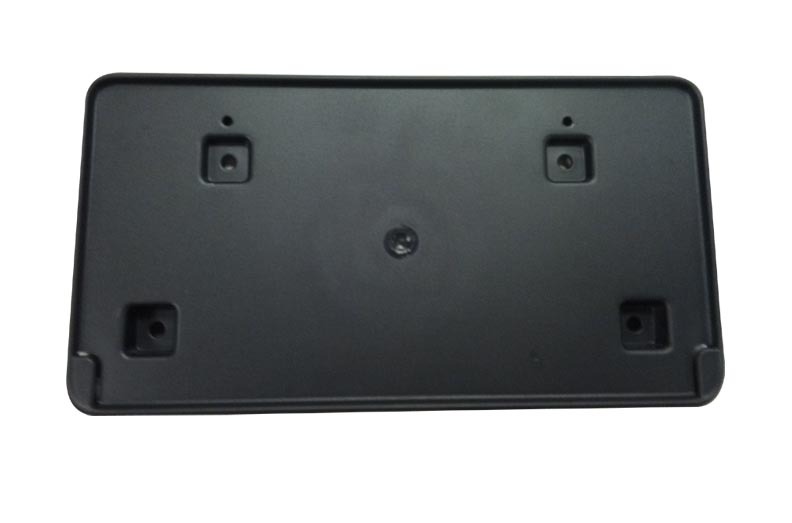 This original equipment part comes with the mounting screws. Whether you're replacing a damaged bracket or adding one as an appropriate home for your genuine Yosemite Sam license plate (we're not here to judge), JustforJeeps.com has the bracket you need, along with hundreds of other parts for your Grand Cherokee or other Jeep model. Will not fit SRT8 Grand Cherokee models. Mounting screws are included. I received the unit quickly. It attached to my front bumper with no problem. I'm just no sure right now if the little brackets at the bottom corners will allow me to afix a thicker designed decorative license into the bracket. Otherwise I would have given it 5 stars. ConsDirections should possibly mention that you?ll need a drill bit to make the holes prior to screwing it onto the bumper. Exactly what was needed to replace bracket that was knocked off by hit and run ! Perfect fit and came with hardware ! Highly recommend. The product is a Mopar part and was a perfect fit. Installation was a breeze. The only recommendation I have that is not included in the instructions is to pre-drill the mounting holes before installing the supplied screws. Great product! Part was a perfect fit and hardware provided was the right stuff. Directions were good, could be better. There are two tiny dimples on bumper that line up with screw holes not mentioned on directions. Excellent fit, makes adding a novelty tag to the front of our 2013 Jeep Grand Cherokee Limited look OEM. 4-stars for lack of clear directions as it appears the only method of attachment is to screw directly into the fascia of the molded/plastic front bumper. The bolts to attach the tag also penetrate the bumper fascia; I am not sure if this is normal and is as it should be without the lack of information in the instructions. The bracket completely hides all bolts and holes so I can only assume this is correct; once mounted fit is excellent and looks great. I would purchase again. ConsThe 4 mounting bolts for the bracket as well as the tag mounting bolts penetrate the plastic fascia of the front bumper, lack of instructions indicating this is normal. Shipped quickly and fits perfectly. I had to order this bracket due to mine not coming with one when I bought it from a dealer.. I was very pleased with the design of the product as it totally matched the curves of the front bumper as well as it was simple to attach following the instructions included...thank you ! Product came as promised and fit the front of my 2011 Grand Cherokee perfectly. Installation was simple; just make sure you have a drill handy to make pilot holes in the bumper. Fit and easy to install. Local Jeep Dealer wanted 68.95 for this. Guess thats why I didnt buy it there. This was exactly what I was looking for. Dealers said it didn't exist (wonder what they do in states that require front plates?). The dealer promised me one when I bought the Jeep and then installed a cheap plastic thing. ...don't go for the cheaper universal brackets...this one is custom fit for the Grand Cherokee's every little curve. Installs easily and looks great. If you have to use a front plate, use this bracket. FYI - I had to pre-drill small holes (where the factory already had dimples) in the bumper to get through the multiple layers of heavy paint. Great solution to having dealer attach license plate directly to bumper cover. ConsLicense plate mounting screws too long. They hit bumper cover and push bracket away from bumper. I had to drill two additional holes through bumper cover in order for bracket to stay flush with bumper cover. Customer service expedited the item quickly. It was an exact match and fit for my 2011 Jeep grand Cherokee. Would definitely order from you again.